This 21′ Renfrew model enters our Silver Streak line-up as one cool ‘hall of fame’r’! We wanted to build a boat that not only looked awesome but functioned and encompassed the amenities you would expect from a big boat. The 21′ Renfrew Hard Top is a custom build for the discerning fisherman with unique features such as, a sun roof, custom engine skins, unique colour combinations, remote-control auxiliary motor, stereo, speakers and so much more! Offered for sale to one lucky owner to own a one-of-a-kind Silver Streak! Get into your dream boat for $130,844.00 Now $121,000 + applicable fees/taxes. 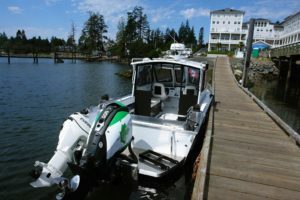 This amazing 21′ Renfrew also features under water lights, Kawi Green custom colour decals, yoga matting covering the dashboard and headliner, a moon/sun roof! and a stereo with extra speakers. 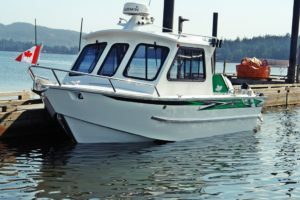 It is all ready for many adventures out on the water and if you want to get noticed, this is your boat! 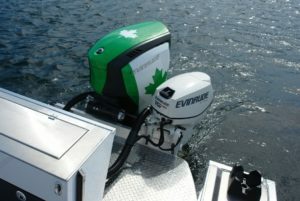 Visit our New and Used Boats Section for more info.